Home › books › My turn for a give-away!! My turn for a give-away!! I got my big box of author copies this weekend!! So even though Lisa beat me to it, I’m going to hold a give-away of a signed copy of my book! Leave a comment to be entered! Tell your polymer and metal clay friends! I’ll choose a winner Saturday 3/27. Even though I spent 3 days with Lisa at CHA I never did get a book! a Mike Buessler class that predates your leaf print molds. (Yours is more permanent). I guess it pays to hang on to stuff. ooooo, a chance to win a copy of your book????? count me in ! ! ! I just love combining polymer clay with the metal clays!! I can’t wait to see what you’ve done!! It looks like a beautiful book!! Wow a chance to win your book is great. I’ve been reading your blog since you set up shop at Etsy. Looking forward to more posts. The book looks terrific, Patti, with a gorgeous, striking cover. Congratulations on it. Nice cover photography. Can’t wait to see the insides–just in case I don’t win . . . will it be on Amazon soon? It’s already on Amazon for pre-ordering. I think it will be shipped in early April. I have already pre-ordered a copy from Amazon, but a signed copy would be Awesome! Love your combinations of color, patterns and texture. Looking forward to seeing the whole book! Your book sounds like it has great ideas. Can’t wait to see it. Maybe this will give me the kick in the pants I need to jump-start my creativity again! I would truely Love this book. I was first introduced to PMC when it first hit the US market while working in a ceramics and pottery studio. It was exciting but not affordable for the clay hobbiest. Your work with polymer and PMC together shows that a kiln is not needed to create beautiful works of art. I would love a copy of this book to share with my daughters. And will be ordering it if I don’t win it. thanks for the chance to win! It looks like a great book! Count me in please! Am just getting into polymer clay (I was seduced by colour) and would love a copy. ooo a second chance! 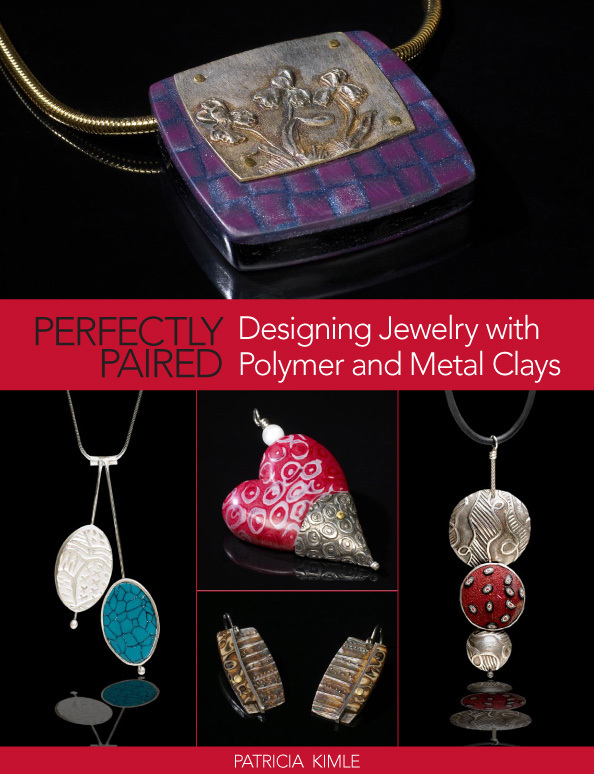 I would dearly love a copy of this book as I love both polymer clay AND metal clay! Thanks for doing this! Hey this would fit right in with some ideas I am trying to find time to work out. Count me in! This book sounds great. So glad you’ve done it. I’ll definitely be getting one …..even if I don’t win! I would love a copy of this book. I am interested in adding metal clay to my polymer clay, so this would be perfect. I’ve already had a sneak peek at this book. Lots of fabulous surface techniques for polymer clay, and lots of excellent information about attaching polymer clay to metal — no doubt you’ll learn many useful new tricks.